Pharaoh’s Tomb is one of Novomatic’s better products, evident both through the visuals and the game’s mechanics. With rewarding features across the base game and bonus round, this slot is definitely worth a spin. As one of the finer products in the Novomatic game offering, Pharaoh’s Tomb is bound to meet all expectation of the demanding slot player audience. It stays true to one of the most popular themes on the market, and manages to incorporate just the right elements as symbols that would emphasize it and allow for extra rewarding features at the same time. Players are advised to learn more about the mechanics of the reels and the slot’s overall rewarding potential, best done through a review of its key segments. Ancient Egypt is the backdrop of this slot’s theme, but it tends to focus on the sarcophagus and the main objects used in burial ceremonies. The name of the game is descriptive enough to get players interested in its immersive gameplay that provides an overall entertaining and enjoyable player experience. The storyline follows all the gold and riches that Egyptians used to place in the Pharaoh’s tomb for their afterlife, and it is up to you, the players, to decide how far you’ll bet in order to get the riches to yourself. Novomatic are known for keeping the graphics and animation effects on the low, but that isn’t exactly the case with Pharaoh’s Tomb. Namely, this release has seen the developers team put in the effort for some high quality graphics in order to display the symbols on the reels in their best shape. The symbols include everything from the industry standard card symbol as the most basic instance, through hieroglyphs signifying wings and water, all the way to the golden animals – snake, eagle and scarab and the Ankh cross. Sound and animation effects are triggered by the special symbols, the Wild and Scatter, adding some much needed interactivity to the otherwise dry and simplistic paytable. 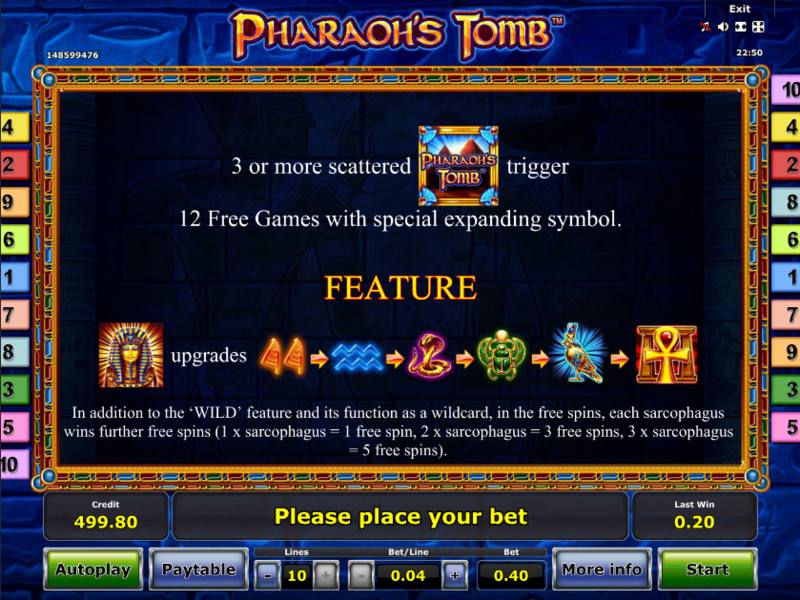 The Pharaoh’s Tomb slot gameplay can be adjusted in terms of paylines, as players can activate 1 to 10 at a time, and thus dictate the potential payouts. Combinations on the slot’s 5x3 reel grid are activated left to right for all but the Scatter that can trigger its feature anywhere on the reels. The paytable amounts change based on your chosen bet size, with three or more symbols required to land on the respective paylines in order for players to hit a win. Starting from x100 payout per bet line on the lowest paying symbols, through x200 for the hieroglyphs, x250 as the snake’s max payout, x300 for the scarab, all the way to x400 for the golden bird and x500 for the Ankh cross, gameplay is definitely worth the trouble. What’s more, the max payout can be triggered on multiple paylines in a single game round, because symbols are stacked on each reel. Players looking for lengthier gameplay are free to activate the Autoplay option, although it lacks any options beyond button that starts/stops the autoplay. Moreover, the winning combinations you would land on the Pharaoh’s Tomb can be gambled further, as it triggers the red/black card gamble with a 50/50 chance and 0 house edge. The Pharaoh’s Tomb reels feature both a Wild and a Scatter symbol, making any special features an expected occurrence whenever they land on the reels. The Wild symbol marked by the Pharaoh’s statue serves to substitute all other symbols but Scatter in order to trigger the most rewarding potential winning combination. This symbol appears solely on reels 2, 3 and 4, with the ability to expand applicable for both the base and the bonus game. The Scatter symbol – the Pharaoh’s Tomb logo, can land a minimum of 3 scattered symbols across the reels and thus trigger the bonus game round. Consisting of 12 free spin games originally, the bonus round allows players to retrigger it with another 3-scatter hit, or at least increase the number of free spins by landing 1 Wild for 1 extra freebie, 2 Wilds for 3 extra freebies and a max of 3 Wilds for 5 additional free spins. 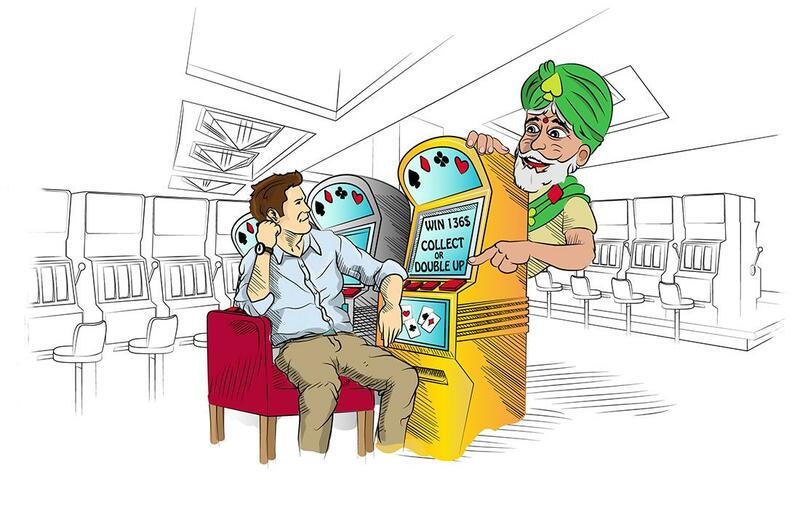 Whenever a spin during the free spins bonus round lands a Wild, the winning combination it is a part of will get upgraded to the closest higher rewarding symbol. The order to upgrading is based on the symbol’s payouts, from wings and waves hieroglyphs, through the snake, scarab and eagle, to the cross, as part of the Pharaoh’s Tomb feature. 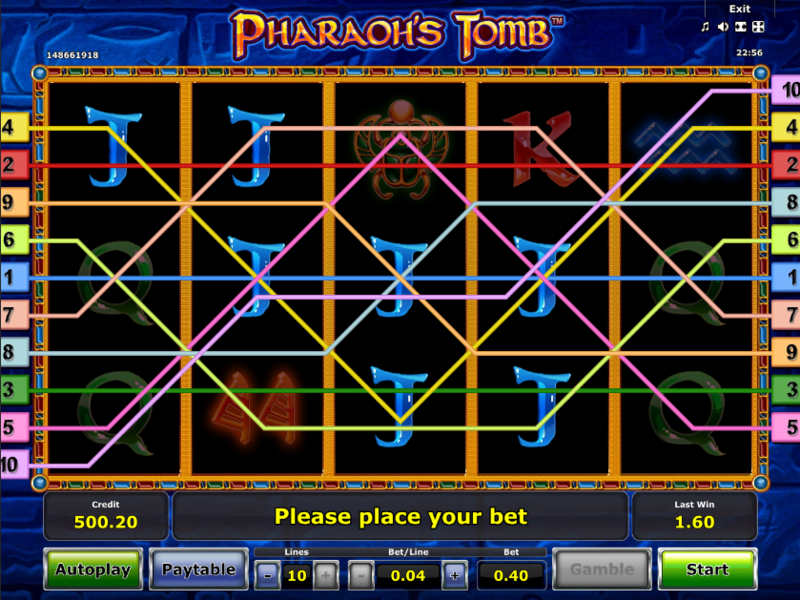 Bets per single payline on the Pharaoh’s Tomb reels range from $0.01 to $10.00, and players are able to activate one or all ten paylines per spin. This means their bet size can range from $0.01 up to $100.00 per spin. Players are looking to hit the maximum win of 5,000 coins, i.e. $25,000 for a $50 spin that lands all five crosses on the reel grid. 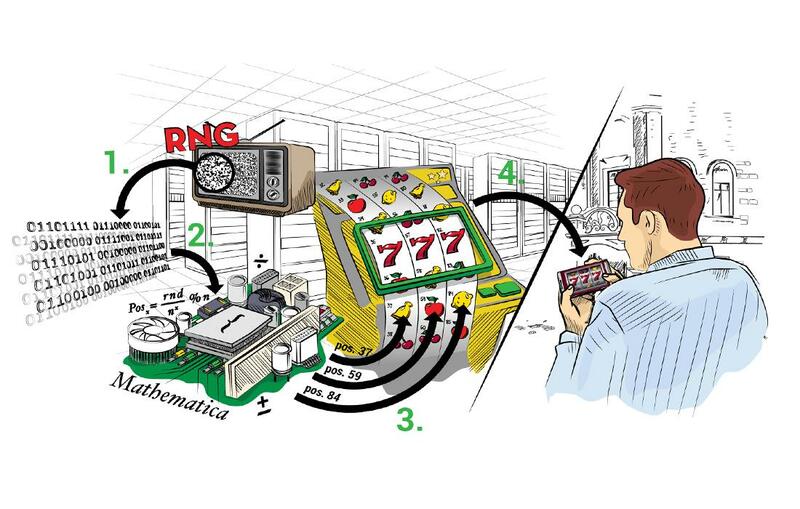 The RTP percentage estimated for this Novomatic’s slot is 95.08%, and it belongs to the category of medium variance games. 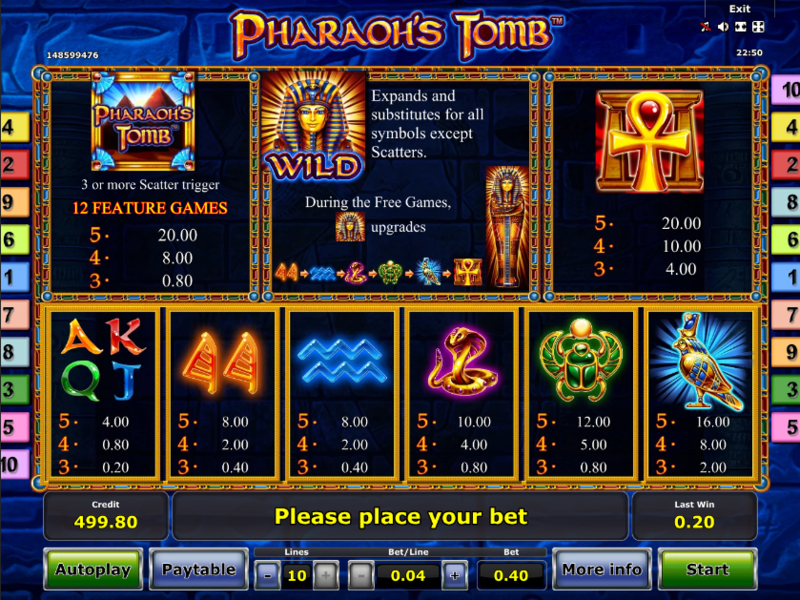 This allows players to make smaller bets and still end up rewarded, often times with the higher value combinations or even the most rewarding Pharaoh’s Tomb feature. All in all, Pharaoh’s Tomb is one of Novomatic’s better products, evident both through the visuals and the game’s mechanics. With rewarding features across the base game and bonus round, this slot is definitely worth a spin.